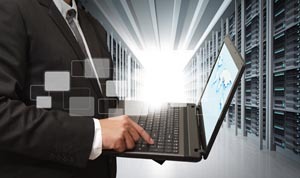 The Database/Data Repository is key to all business apps. 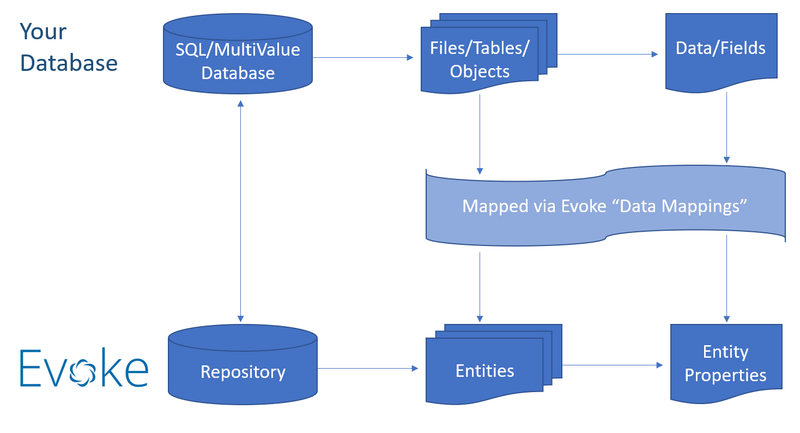 Evoke allows you to connect to and manage data with multiple databases, of all different types, from within a single app design. New Evoke users are invited to participate in an "Environment Review" meeting. During the environment review BlueFinity will help check that the Evoke installation has been completed, users can access and use Evoke, start to create an initial app and help with connection to the required databases. This section summarises some of the options for using your different databases with an Evoke App Design. 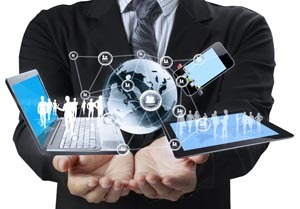 Identify how you will connect to your database. You can select, from a dropdown list, the connectivity product/component you want to use. You can then use Evoke connection tools to help check the connection and ensure a good communications route to your database. 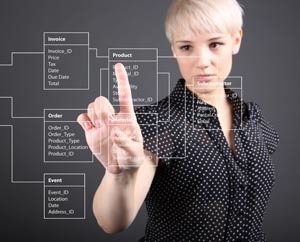 Now you have connected to your physical databases, you need to define, for the App User Interface (UI), the data structures (shape of the data) that the UI will use. Your app can use these data structures to manipulate data that will be passed back and forth with the database. In Evoke these are called Entities. Entities in Evoke define the structure of the data that is part of the tables/files in your physical (backend) database and will be used by the App. As such an Entity may define a record with several fields/properties that are spread out throughout a record with many dozens of properties/fields in the physical database. However, you UI data structures can be set up as they would be best suited for the app and not limited by the way your database is structured. In addition you can set up data structures that are local to your app and are not stored in your databases, create calculated properties, classifications (static and dynamic drop-down lists) and Selections that will populate data from your database into your app UI to be displayed, updated, deleted, added to and manipulated in other ways before being updated in your database repository. Entity structures can be automatically imported and exported to and from your database. You can also use all the linking structures that you use in your existing database e.g SQL (joins, link tables, etc) and MultiValue (local or remote keys, embedded multivalues and subvalues, etc) as part of your Evoke data structures. For each database/data repository you need to provide mapping information that defines which Evoke Entities are associated with which tables/objects/files and which database fields/properties map on to which Evoke Entity Properties within your app design data model. This is done in the Data Mappings section of Evoke. Evoke can access tables/objects in different databases, so you might have a product table in a SQLServer database, a Supplier table/file in a Universe (MultiValue) database, a customer table in Oracle, an orders file in a jBASE (MultiValue) database, etc. You simply identify which Evoke Entities relate to which tables or files in which physical database (Repository). It is very likely that initially all of your entities will be hosted in the same, single database (repository), however it is possible to access multiple repositories within a single app as and when required. Selections are used to Select certain data from your Repository (database) Tables/Files/Objects to populate local data areas (Data Sources) within your app. Evoke provides "wizards" to help you create your selections, including any parameters to be passed into them. Each one is linked to a Table/File/Object in your database and Evoke generates the full selection code (even the DataBasic for MultiValue databases). 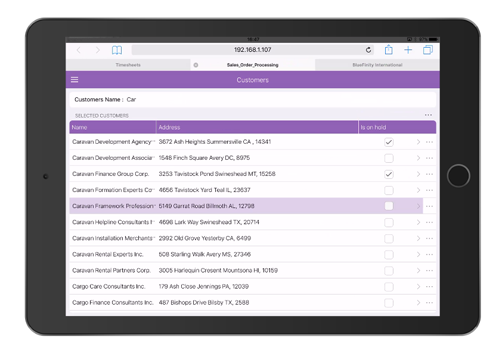 You are able to Filter and Sort your data, call your selections from Evoke widgets and click actions. You can even customise your selections, and when you do the customisation will be automatically preserved through each regeneration of your app design so that you do not have to re-apply it each time. Evokes unique "custom code hooks" allow you to easily incorporate any existing sub-routines or code that you have written into the selection or data manipulation process without having to re-write it.